took over my summer and early fall. It will be out soon. Now the blog is back and my goal is to post a lot more often. 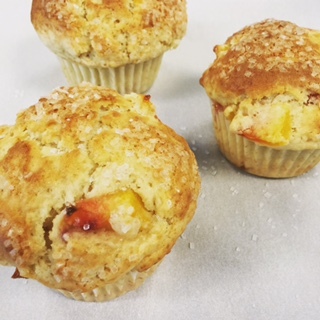 About ten days ago, I posted a Sourdough Peach muffin on Instagram and got a few requests for the recipe. I had promised that I would feature that recipe here on the blog and now I am making good on that promise. I know the proper and hip thing to do would be to be blogging about pumpkin spice and Thanksgiving but I promised and when I promise a recipe I have to make good it. Don't worry, I have some nice posts planned for your holiday baking - focusing on getting ahead, making the perfect pumpkin pie and in general being the best baker at your holiday gatherings. This is for all my readers who maintain a sourdough starter, for those of you who don't the starter can be replaced with sour cream or yogurt. These muffins, made with starter, are really tender and delicious and a great way to use the starter that you would normally discard. 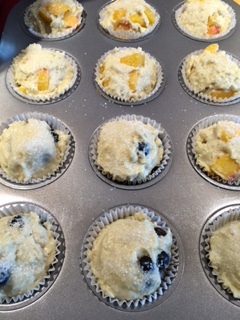 Just a side note - to make these muffins - your starter should not be exhausted or in distress just in maintenance mode - which means you have been feeding and discarding at least once a week. The starter should be looking like pancake batter - if there is liquid on the top and you haven't fed it in a while, clean it up and give it a feed (usually 300g water and 200g unbleached all purpose or bread flour id perfect) and then let it sit out, covered at room temperature for a few hours. Then you are ready to bake these delicious muffins. You can use any fruit you like, blueberries, apples, peaches, and pears. It really is a blank canvas. Again, these muffins are delicious. They have less fat then most cake muffins and keep well due to the sour. 7 ounces fresh blueberries, chopped peaches (frozen work great), pears, or apples. Line a 12 cup muffin tin with muffin liners. 2. 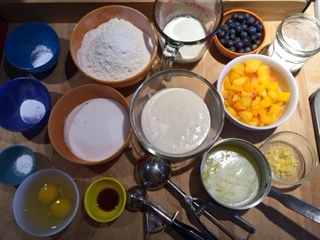 Mix together starter, melted butter, sugar, eggs, buttermilk, vanilla, lemon zest until smooth and combined. 3. Combine the wet into the dry ingredients, mixing together with a spatula, Try to use no more then 15-20 strokes. 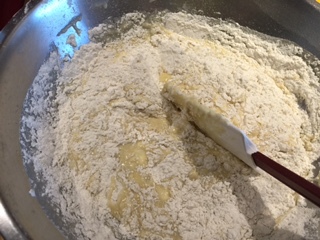 Stop mixing when the flour disappears, Fold in the fruit quickly. 4. Scoop or spoon batter into prepared cups. 5. Garnish with coarse sugar if desired. 6. Bake at 350 degrees, start checking at 25 minutes. The muffins are done when a cake tester or skewer inserted in the center comes out clean. For some reason the second time I baked them they did not take on a lot of color. The oven at school has a top heating element - that made a difference. We can achieve this at home by moving the muffins or anything we are baking to the top third of the oven for the last few minutes of baking. But don't walk away - they can over brown quickly.